Aero Classics Models: one limited edition collectable, die-cast metal military model in a 1/400th scale of a Boeing B727-227/Advanced in the Braniff Intl Airlines Old 1990s Ultra Dark Blue Colors Scheme. Airframe Registration N457BN. This model is constructed of die-cast metal with some plastic parts. This product is available beginning in July 2017. Aero Classics Models: one limited edition collectable, die-cast airliner model in a 1/400th scale of a Boeing B720-051B in the CONAIR of Scandinavia Airlines Last Colors Scheme. Airframe Registration OY-APW. This model is constructed of die-cast metal with some plastic parts. This product was produced in Released in November, 2015. 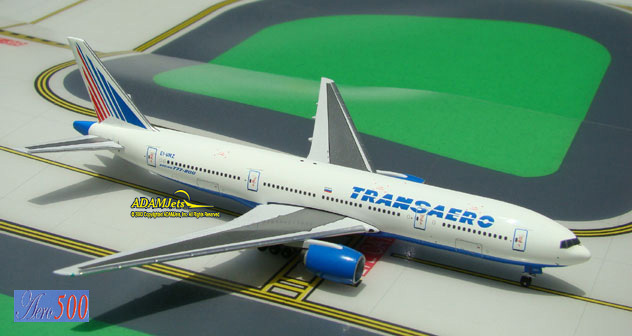 Aero Classics Models: one limited edition collectable, die-cast airliner model in a 1/400th scale of a Boeing B720-051B in the Maersk Airlines Old Scheme. Airframe Registration OY-APZ. This model is constructed of die-cast metal with some plastic parts. This product was produced in Released in November, 2015. Aero500 Models: one limited edition collectable, die-cast metal airliner model in a 1/500th scale of an McDonnell Douglas DC-10-30 in the SAS - Scandinavian Airlines Old 1970s Colors Scheme. With titles Olav Viking. Airframe Registration LN-RKA. This model is constructed of die-cast metal with some plastic parts. This product is available beginning in January 2018. Aero Classics Models: one limited edition collectable, die-cast airliner model in a 1/400th scale of a Boeing B720-068B in the Saudia - Saudi Arabian Airlines Old Colors Scheme. Airframe Registration HZ-ACB. This model is constructed of die-cast metal with some plastic parts. This product was produced in Released in November, 2015. Aero500 Models: one limited edition collectable, die-cast airliner model in a 1/500th scale of a Boeing B777-212/ER in the Singapore Airlines Current Star Alliance Color Scheme. Airframe Registration 9V-SRE. This model is constructed of die-cast metal with some plastic parts. The product was released in February, 2016.